When I last visited the Bucks County Playhouse – in August 2002, to review a production of Camelot – I felt sadly certain I wouldn’t be going back. Though the show had some charm, it was one step away from community theater, with scenery and costumes that might have been borrowed from the local high school. The Playhouse itself was fading fast, in dire need of a physical and artistic overhaul. It was a far cry from Bucks County’s glory days as a major regional venue. Since it opened in 1939, the Playhouse had boasted casts that included Helen Hayes, George C. Scott, Julie Harris, Jessica Tandy and Hume Cronyn, Robert Redford, Bernadette Peters and many more. Major plays were presented there in important productions. And its setting in New Hope, backed by the Delaware River, is one of the loveliest of any theater in America. All this seemed destined to be lost in 2010, when BCP closed its doors. But this is the (too rare) theater story with a happy ending. Through the heroic efforts of a number of important theater people – they include Tyne Daly and producer Jed Bernstein – the Playhouse was renovated and reopened in July 2012. Even better, under the current leadership – Producing Director Alex Fraser, Executive Producer Robyn Goodman – the BCP is also aiming to recapture its centrality as an important venue. The other strategy involves a series of old-fashioned crowd-pleasers, for which the summer months, and charm of the theater and the town, are ideally suited. Fraser and Goodman are putting significant resources into these productions, including some stellar actors. For the next few weeks, you can see Ira Levin’s Deathtrap, featuring the redoubtable Marsha Mason. Then, beginning on July 17th, they’ll be scoring a real coup – Christopher Durang’s Vanya and Sonya and Masha and Spike, winner of the 2013 Tony for best play, will take the stage – with the author in the wonderfully rich role of Vanya. (This is no mere gimmick – Durang is a very accomplished and funny actor.) Also in the cast is Marilu Henner, who ought to be sensational as the self-centered but delightful Masha, a former movie star whose career has seen better days. 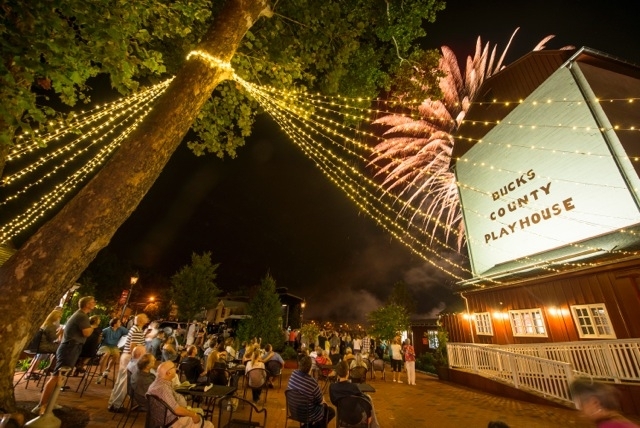 For Durang, this is playing for the home team – he is a longtime resident of Bucks County. For the audience, it’s a home run.